Perfect tailored fit. Zipper is subdued and well made. I had to exchange this over fit, but now that the replacement arrived at a size that fits I find I enjoy the way it looks in the mirror. Zipping the neck of the black sweater I suppose I need to add a short beard, a beret, a hand bongo, and a scrap of bad poetry to complete the look. Very tasteful. 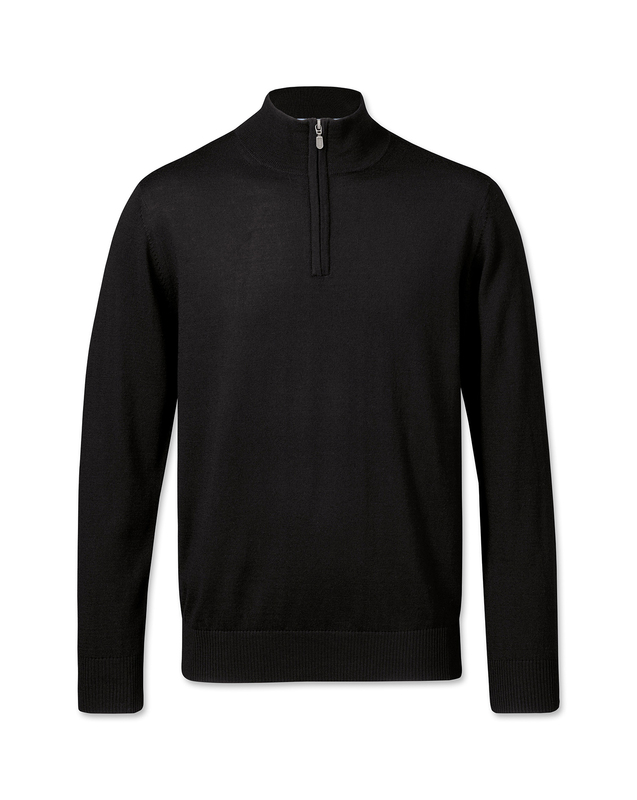 The conservative black color and modern design makes this a power sweater. The wool is unusually thin. This reduces the warmth to the point that cold air in my office is felt coming through the sweater. Also, the zipper is difficult to unzip when completely zipped up. I suspect the zipper will stop working at some point. I don't know if the zipper is flawed, or if it is sewn on incorrectly. Perhaps both the thinning of the wool and the zipper problem are attributable to Chinese manufacturing. I would have returned it, but the packaging was discarded prior to trying it on. That is my fault. I have generally been satisfied with CT products in the past. I may try another sweater, but will only buy a turtle neck. Response from Charles Tyrwhitt: I am sorry to hear that your purchase was not quite as expected. While our knitwear can be a bit thinner due to being more of a layering piece, this should not impact on the warmth. We do indeed source some of our products from overseas, however we work extremely closely with our suppliers to ensure that the best possible quality is provided. You can of course return or exchange your items regardless of retaining the original packaging, please do let us know if we can assist you in any way.